She’s been criticised for her outfits in the past, but Princess Eugenie was looking every inch the stylish star as she visited Windsor Castle to view the royal wedding exhibition on Thursday night. The 28-year-old was seen smiling as she viewed the display, which features her stunning Peter Pilotto wedding dress. Eugenie dressed up for the occasion in a chic lace black midi dress, which she layered with a gorgeous monochrome coat. She kept her accessories simple opting for a sensible pair of black court shoes, and wore her brunette locks out in soft waves. “Last night Princess Eugenie visited Windsor Castle to see the installation of HRH’s & Jack Brooksbank’s wedding outfits,” a post shared on The Royal Family Instagram account read. Last night Princess Eugenie visited Windsor Castle to see the installation of HRH's & Jack Brooksbank's wedding outfits. Here HRH views her dress alongside Senior Curator Caroline de Guitaut (left) and Head of Exhibitions Theresa-mary Morton (right). 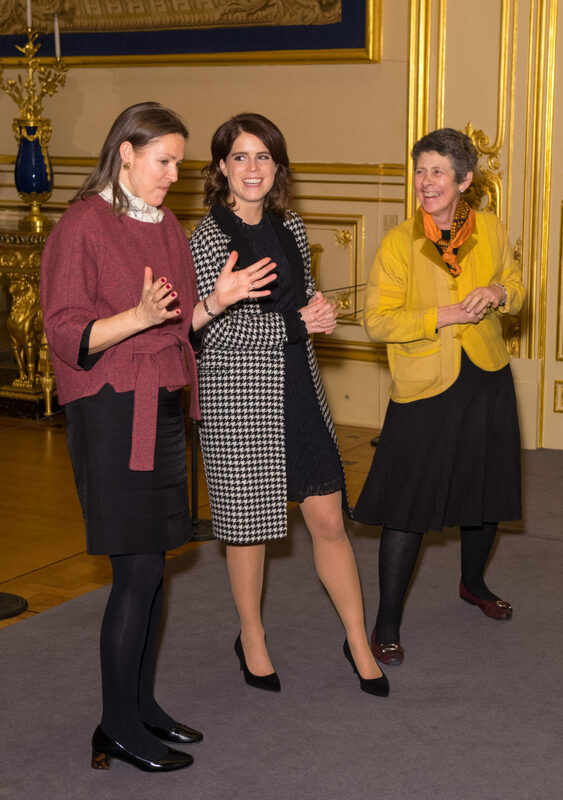 The exhibition displaying the outfits, including Princess Eugenie's dress, opens today as organised by @royalcollectiontrust Find out more by clicking our link in bio. The exhibition, which runs for seven weeks, will not only allow royal fans to get a good look at Eugenie’s off-the-shoulder gown, as the stunning Greville Emerald Kokoshnik Tiara will also be displayed. One of the Queen’s personal tiaras, the stunning headpiece is made of diamond, emerald and platinum and features a large emerald stone in the centre. Mr Brooksbank’s wedding outfit, which comprised of a black and grey morning suit with a vivid blue waistcoat, made by tailors at Huntsman on Savile Row, will also be shown. There will even be a special recording from Eugenie herself which has been created for visitors of the exhibition. Read more: Royal exhibition: Harry and Meghan’s wedding outfits on display. Eugenie and Jack are following in the footsteps of her cousin Prince Harry and his wife the Duchess of Sussex, whose own wedding outfits were also placed on display at the end of last year. Titled ‘A Royal Wedding: The Duke And Duchess Of Sussex’, the exhibition, which launched in October, gave fans a chance to relive the couple’s special day which was watched by millions across the globe, finishing just last month. Meghan’s Givenchy gown was displayed alongside her intricate veil and husband Harry’s Savile Row-tailored military uniform. You can visit ‘A Royal Wedding: HRH Princess Eugenie and Mr Jack Booksbank’ from March 1 to April 22, 2019. Are you a fan of Princess Eugenie?